Cool yourself this summer without your energy bills going through the roof ! With skyrocketing energy costs, which most families simply cannot afford to pay, Australians are actively looking for effective ways to save money on their power bills. Shopping around for the best electricity provider, washing at off–peak times, turning power points off, half filling the jug when you boil it, using the microwave to speed up cooking times, hanging your clothes to dry outdoors, putting on extra jumpers, using a hot water bottle... are all becoming common place practises in Australian households. But with a sizzling Australian summer expected, and air conditioners accounting for 40 per cent of the electricity used by NSW households during the summer, families are very nervous about the potential summer energy bills. Unlike in winter, where you can go to bed with a hot water bottle early, or put on another jumper: getting cool in summer is a more difficult task and a more serious one. A hot environment can cause the body to overheat. In extreme conditions, heatstroke may occur, and this condition can be fatal. The human body only functions properly if the temperature deep within it is maintained between about 37 and 38°C. Heat stress begins when the deep-body temperature rises above about 38°C. Safeguard against potentially life-threatening heat stress ! It is vital to be able to cool your core body temperature down in summer. Ceiling fans cost approximately 2 cents per hour to run v/s air-conditioners, which depending on the size, can cost between 13 – 55 cents per hour to run. Using a fan in summer to cool yourself down, instead of an air conditioner can slash your power bill and reduce carbon pollution. But, the ideal solution would be your own portable cooler with none of the associated electricity costs and environmental damage. You could then enjoy all your favourite outdoor activities as well, such as gardening and lawn bowls, without sweltering in the summer heat. Wear a neck cooler ! So easy to use ! Embrace the cool ! The solution is here. Cool off in summer with eco friendly personal cooling products ! Our Australian designed Cool Hats and Cooling Neck Wraps are a body cooling system to keep you cool when working, playing or relaxing. 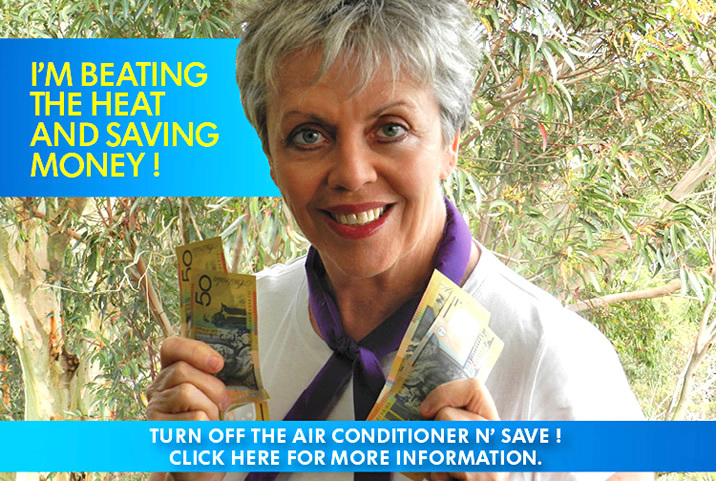 Turn off the air conditioner and save money on your power bills this summer! Wear a Neck Cooler. Take advantage of our special bulk packs of Neck Coolers. The whole family can have several each. Store your personal coolers in your fridge. Your fridge is one of the few things you will not turn off. Swap the cooling Neck Ties over throughout the day. You will save thousands of dollars on power bills over the many years the Neck Coolers will work to keep you cool in the summer heat. How do these personal body cooling products work to cool you off ? The secret is in the highly absorbent polymer crystals which retain water when soaked, forming a cooling gel that feels heavenly on a parching hot day. The cooling bands cool the blood in the carotid artery that runs to the brain up the back of the neck. This cooled blood then travels through your bloodstream continually pulling the heat out of your bloodstream. The coolness circulates throughout your whole body and brings your body temperature down to a comfortable level. You literally get your entire body cooled from the inside out! Neck Coolers should not be frozen, as frozen temperatures can cause vascular constriction which can restrict the body's ability to shed heat. But many people place the cooling neck ties into their normal fridge compartments, and then swap them over throughout the day. Don’t be concerned when your body gets used to the temperature of the Neck Cooler and it does not feel "cold" anymore. Think of jumping into a swimming pool. Your body reacts to a sudden change in temperature and feels cool initially, before becoming acclimated to the cool feeling, and you notice it less. The same applies to your cooler. Your cool tie is still working to keep your core body temperature low for a long period of time. What else can I do to get cool in the summer heat ? Stay hydrated. Drink plenty of fluids, even if you do not feel thirsty. The rate your body can absorb fluids is less than the rate it loses water due to perspiration. Avoid drinks with caffeine or alcohol. Alcohol and caffeine constrict blood vessels near the skin reducing the amount of heat the body can release. Eat small meals and eat more often. Avoid foods that are high in protein because they increase metabolic heat. Wear loose-fitting clothes. Lightweight, light-coloured clothing reflects heat and sunlight and helps maintain normal body temperature. Do not leave children or pets in a closed vehicle, even for a few minutes. Work in short periods, followed by longer rest periods. Close the curtains on the sunny side of your house to help keep the temperature down inside the home. Wear a Cool hat with a magic Cool Pad when you go outdoors. ORDER ONLINE - Click here to order a Neck Tie Cooler, SUPER Neck Tie Cooler, KidzKooler or Cool N Safe Neck Cooler.